I get real lazy on Sundays. 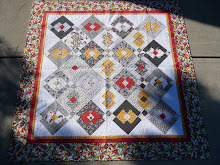 I think about quilting, but right now I am enjoying watching the birds at the feeder outside my kitchen window. We have squirrels too, so the feeder doesn't stay full long. There is more food in the bird feeder than there is in my refrigerator. I've not been doing much cooking; my oven has been broken since December. Easter morning the hot water heater went out. The water heater was priority repair. We have a lot of condiments, and I had enough stuff to make a reasonable lunch basket for work. Breakfast was "super greens," an avocado, and flax, chia, & hemp seeds sprayed with a little Bragg's Liquid Aminos. Although I eat healthy, I had a little set back in my campaign to rebel against the march of time. I signed up for ice skating lessons, and the first session of 6 weeks went really well. Ice skating is way harder than it looks, but, because of my middle school roller skating experience, I passed over Adult Level 1 and began in Level 2. At the end of the 6 weeks we were tested and I passed to level 3. I was stoked. After level 4 you get to take Ice Dancing, and that was my goal. I was late to the first lesson of the new 6 week session of classes (work, traffic etc), but I was on the ice exactly at the moment the class began. Both the front desk employee and the instructor told me I could pay at the end of the class. Ten minutes into instuction the manager came onto the ice to get me to tell me to go pay. Then when I looked at the bill there was a $25 dollar charge for "recital fee." Seriously? Everyone (even over 50 years old) has to pay. So I whipped out the credit card and waited impatiently (the class is only 30 minutes) for my reciept. I was flustered and angry when I went back on the ice. I hate to miss instruction. It is rude to the class and cheats me out of learning time. I am taking a little break from ice skating. The knee is bruised and getting better, but I joined a new gym and went back to water aerobics. Maybe I'll try the Zumba and Kickboxing too. Once I can put weight on my knee I'll give mat Pilates a go too. It is nice that quilting is a low-bodily-risk activity! On the Shop Hop, I found these two kitty fabrics at Quilts and Fixins in Jonesboro, GA. They have a whole room of animal prints, but what I really like about this shop is how friendly the women are. They are pet enthusiasts and sell snacks to donate proceeds to pet rescue. And that is why I don't skate anymore, lol. I hurt myself enough, don't need anything to help it along;) I love working out in the pool, really great for stiff joints and low impact. I have some of those siamese cats in corduroy that I put into a heart quilt from old clothes. Very sorry to hear about your knee. Love the kitty fabrics. When I saw the Siamese cats I thought of Lillian Jackson Braun, the Cat Who mysteries... I sure miss those books! I met her once at a book signing in Mt.Airy NC. Such a beautiful lady!